Among the many different challenges that you will face in Guacamelee 2, one of the hardest ones will be the boss known as El Muneco. Do not worry if you are unable to beat the boss, as our Guacamelee 2 El Muneco Boss Guide will help you with it. 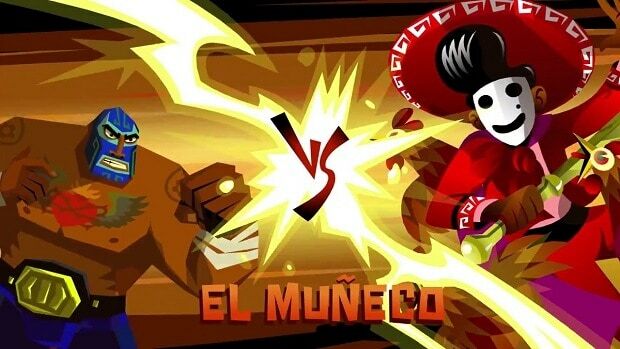 Our Guacamelee 2 El Muneco Boss Guide will outline the moves of El Muneco and give you various different strategies that you can use to beat him. There are a total of 5 abilities that El Muneco has. Melee attacks with his sword are preceded by him hiding behind his cape so you can predict them. Projectiles are fired once he teleports to the top of the room so you can also predict them. El Muneco occasionally transforms into a tornado and moves across the ground which you need to learn to dodge. El Muneco also summons allies to his aid and transitions into the background to call a lot of chickens into battle. All of these can be contained though and let’s look at how. At the start, El Muneco has 2 Eagle Boost Points in the ID screen and spikes below. Both of them are quintessential to your success. El Muneco is difficult if you do not know how to beat him but it is quite easily possible once you understand what he is doing. Roll through his projectiles and his melee attacks. In order to avoid the Tornado, however, you will need to activate a spike trap and hide behind it so that he runs into it. You can also use the boost points to dodge them. Remember that El Muneco always takes a short breather after using his attack. You can use this time to attack. After his projectiles, for example, he will hover and laugh at you. Use the boost to jump up and combo him in mid-air. You can also stun him using the spike traps to deal damage. Whenever the boss transitions into the background and the chickens start to flood, make your way to the gaps in between the waves or use the Spike Pillar Trap to make the chickens crash in. Now that you know how to dodge the attacks and how to deal damage, you can use these tactics to eventually defeat the boss. That is all we have for our Guacamelee 2 El Muneco Boss Guide. Let us know if we missed something using the comments section below!